We all know Japan loves its fake turds, particularly atop buildings or dangling from cellphones, but this is the first we’ve seen that doubles as a flashlight. 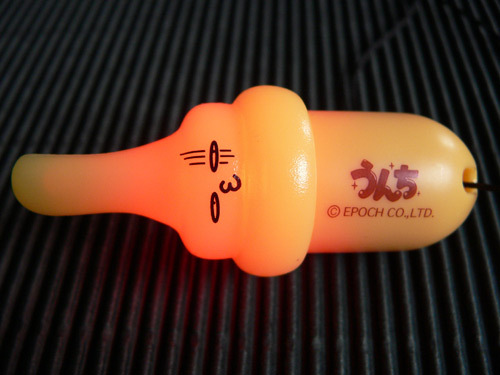 Admittedly, the Unchi (turd) Handlight Mascot is a pretty puny light (it’s just about 2in long), but its Mr Whippy aspect and oh-so-Japanese character are what really matter when it’s sexing up your phone, right? Color varieties are only pink or yellow, but at least the makers keep it real with three kinds of turd - Futsuu Unchi (normal turd), Tochuu Unchi (turd passing through - it’s the pointy one in the pic; get the idea?) and Omori Unchi (jumbo helping). Classy. Alas for inhabitants of the prudish West, the turdlights are available only from a Japanese company called Epoch and - even then - only from their capsule vending machines. Being the nice guys we are, if any readers want to drop us a line via the comments we’ll be happy to pick up a few and mail ‘em to you. Sponsored links: Get your 646-671 dumps and 350-030 test certifications within days using latest security+ certification and other resources of 642-647 certifications; you can get a wonderful 640-802 booklet.